With the new Photoshop Touch app, Adobe brings a bit of the power of Photoshop to your tablet. 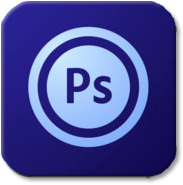 Photoshop Touch is available in the iTunes Store (iPad2 required) and Android Market for just $9.99/€7,99. Well known Photoshop features such as layers, selection tools, adjustments, and filters. Easy selection of part of an image with the “Scribble Selection” tool. “Refine Edge,” where instead of your mouse/pen you simply use your fingertip to refine the selection around those normally very difficult to select image elements like hair. Camera fill feature – fill an area of a layer with the view from your camera. Integration with Google Image Search. Sync projects with Adobe Creative Cloud and open layered files from Adobe Photoshop Touch in Photoshop. Max image size: 1600 x 1600 pixels (enough for a print of 10.7"/27cm at 150ppi). Photoshop Touch?? Is it Adobe Photoshop? Really amazing and adorable one. Like most this creative presentation.